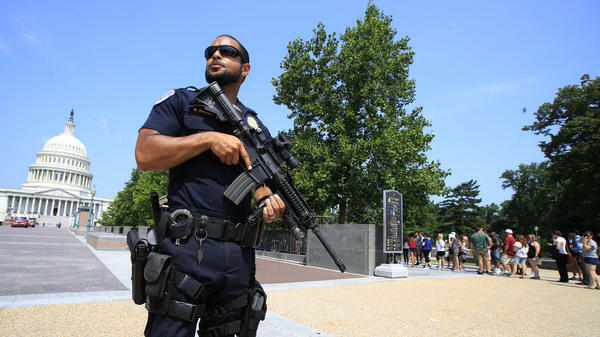 A Capitol Police officer stands guard on Capitol Hill in Washington, D.C., on Wednesday after House Majority Whip Steve Scalise, R-La., was shot during a congressional baseball practice in Alexandria, Va.
Members of the protective detail for Rep. Steve Scalise, R-La., are being hailed as heroes Wednesday, shining a spotlight on the little-known police force that guards the Capitol and prominent members of Congress. If not for the presence of the U.S. Capitol Police officers, authorities say, the toll could have been much worse when a heavily armed gunman opened fire at a congressional baseball practice just outside Washington early Wednesday. "Had they not been there, it would have been a massacre," Sen. Rand Paul, R-Ky., told MSNBC. Although the practice was taking place in Alexandria, Va., across the Potomac River from the Capitol, police were on hand to protect Rep. Scalise, the majority whip and No. 3 Republican in the House of Representatives. "I'm sure it made a significant difference," said Tim Slater, the FBI agent overseeing the investigation. Authorities say two members of the Capitol Police force, Special Agent Crystal Griner and Special Agent David Bailey, returned fire with the gunman before local police arrived shortly after 7 a.m. The two wounded officers are in good condition and expected to make a rapid recovery, according to Capitol Police Chief Matthew Verderosa. "Suffice it to say that our officers acted, I believe, heroically today," Verderosa said. The security service for the U.S. Capitol began with a single watchman when Congress first moved to Washington from Philadelphia in 1800. The force was expanded and formalized in 1828 after a series of incidents, including an assault on the son of President John Quincy Adams in the Capitol Rotunda. Today, the Capitol Police force employs more than 1,700 officers who patrol the Capitol grounds and provide protective services to top lawmakers and their families. Two Capitol Police officers have been killed in the line of duty. Officer Jacob Chestnut and Detective John Gibson were shot to death on July 24, 1998. Chestnut was staffing a checkpoint at a Capitol entrance when Russell Eugene Weston, Jr. burst in and began shooting. Gibson was part of the protective detail for Rep. Tom DeLay, R-Texas, who was majority whip at the time, the same post now held by Scalise. House Majority Leader Kevin McCarthy, R-Calif., praised the members of Scalise's security detail, saying they helped to draw fire away from the baseball dugout where most of the lawmakers were located. "Those two Capitol Police are amazing individuals," McCarthy said.